Teradata (NYSE: TDC), the leading data and analytics company, today announced Teradata IntelliSphere™, a comprehensive software portfolio that unlocks a wealth of key capabilities for enterprises to leverage all the core software required to ingest, access, deploy and manage a flexible analytical ecosystem. Business is continually changing and companies today require greater analytic agility to ensure their competitive advantage. As more analytic users demand access to a larger number of analytic tools and increased data, complex architectures capable of handling this demand are now a business requirement. This forces companies to deploy and manage large, multi-system, heterogeneous analytical environments that are typically comprised of a mix of technologies from different solution providers and the open source community. To address this, Teradata is announcing Teradata IntelliSphere: a collection of key capabilities for enterprises to leverage one simple subscription-based software license and receive all the core software required to ingest, access, deploy and manage an analytical ecosystem. Ingest: Using IntelliSphere, companies can easily capture and distribute high volume data streams, with ready-to-run elastic architecture and quick access for business-critical analysis. Access: Companies gain easy access to data stored anywhere, even in a hybrid cloud or heterogeneous technology environment. Deploy: Deploy applications and analytic models for easy user access and enterprise collaboration. Manage: Management software allows for ad-hoc data movement, as well as ongoing monitoring and control via an operational interface. 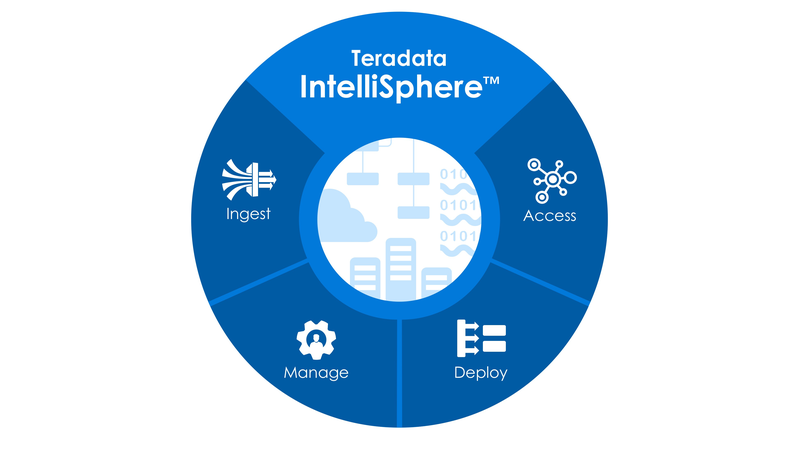 As new software solutions are released in the future they will become part of the IntelliSphere bundle, so customers will get the benefit of access to new Teradata software products under their existing licensed bundle. Teradata IntelliSphere complements Teradata Everywhere and the Teradata Analytics Platform. Teradata Everywhere is a flexible, agile and scalable way to ensure high return on analytic investments, while limiting the risk in making those investments. Teradata Analytics Platform is a key component of Teradata Everywhere, that enables analytic users throughout the organization to use their preferred analytic tools and engines across data sources at scale. For more on Teradata Analytics Platform read our press release . IntelliSphere is available for purchase today. In addition to the IntelliSphere software portfolio, new professional services offerings will be made available to companies to help them more easily implement solutions that take advantage of the software components.